M3M India Ltd. chains up with Larsen & Toubro, one of the leading construction firms to build their finest luxury residence in Gurgaon which is 7 star to be named as “M3M Golf Estate”.. This project will be constructed by L&T in collaboration with LERA International, the world’s leading consulting firms. The estimated worth of this deal of phase – 1 is about Rupees 400 cr, out of a total investment of over Rupees 2,000 cr. Lera International will be providing it’s most modern and pioneering structural engineering designs. In a press release it is declared that the project will be completed in 33 months much prior to the scheduled time of completion of 42 months. The project is tactically located on the Golf Course Road (Extn.) in Sec 65, Gurgaon, which is 30 mts drive from Indira Gandhi International Airport spread over an expansive 75 acrs. Graham Cooke, the world famous architect has designed the magnificent apartments around a 9 hole reversible ‘In City’ golf course. The architecture is a perfect fusion of eco friendly, green sceneries and cutting edge designs. The project is designed by world’s finest architects ARCOP headed by Ramesh Khosla. The project has already received awards internationally in USA, UK and Dubai, as “Best Upcoming Golfing Lifestyle Residence in India” . “In line with our commitment to give the best of quality and timely delivery, we are happy to appoint L&T which is one of the world’s best construction groups. “M3M Golf Estate” is our much honoured project, internationally acclaimed, and we have designed this, keeping in mind the taste, class and the requirements of our target clients. We ensure the use of latest technology and safety of structures” said Basant Bansal, Chairman and Managing Director, M3M Group. M3M Golf Estate offers high – tech ultra modern luxury apartments with all modern amenities like wi-fi in all buildings, roof- top jogging path, and superior class club houses. These apartments will trait world class amenities, unique outdoor and indoor living spaces, modern kitchen, sated with fittings and high quality end fixtures. 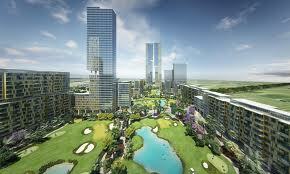 It also offers aesthetically designed golf course. This entry was posted in Real Estate News and tagged Apartment, Dubai, Golf Course Road, Gurgaon, Haryana, India, M3M Group, M3M India Ltd., United Kingdom, United States, wi-fi by admin. Bookmark the permalink.